Since 2001: Building custom personalized combination boards. When you use one of the 3 Standard Options shown above, you can make the overall width and high any size you like. 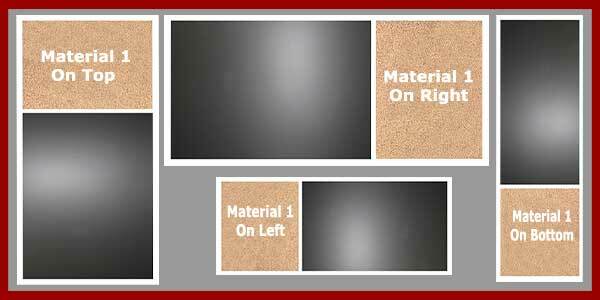 You can personalize combination boards that are very long and narrow - or very thin and high. You simply pick the format and select the material - we will create the combination board to fit your custom size. Use your fabric or ours - and create that special look for your combination board. We offer over 50 colors of a thick textured fabric - perfect for heavy use. Use push pins, thumb tacks, T-pins or Velcro. After selecting the frame style and combination format - you will be directed to a special page to add the fabric. Preview Our Fabric Colors Options Here. Learn How To Add Your Fabric Here. Choose the Frame - Size - Format: Then create the perfect combination to percisely fit your space. Attractively organize you walls to fit your decor - function and lifestyle. Personalize your family room or kitchen - a childs room - the waiting room of a business - an office lunch room - school hallway and so much more. You can purchase a very unique combination directly on our site by selecting the check box for "I want to create my own unique combination board". There you will be able to describe your design in detail and add an image to show us a layout of your idea. We will always contact you should we have any questions. All the options shown ABOVE can be purchased directly on our site. Select Any Product - Then select The Combination Board Icon Image and proceed to create your wallboard. The items shown BELOW can be made to your specifications. Please CONTACT US for help with the creation of a similar style for your home or office. 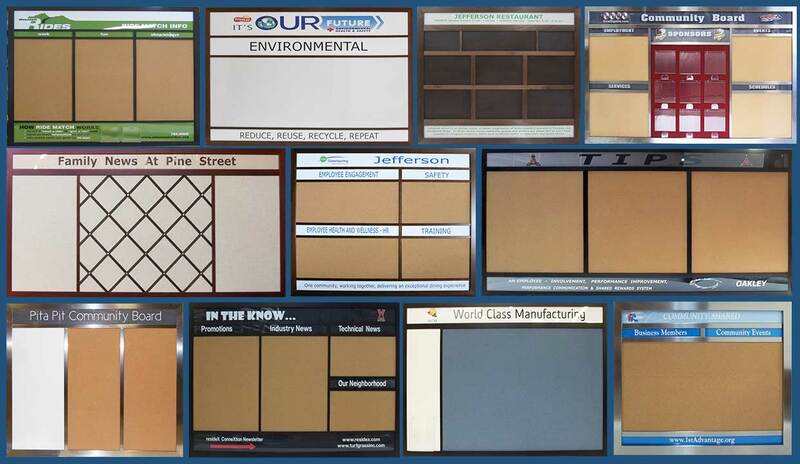 Personalize a wallboard your family room or kitchen - a childs room - the waiting room of a business - an office lunch room. or school hallway. Custom Header Boards can be made in any size. Custom information boards of any size - designed to support your objectives with style and function. Learn more about our custom information boards here. Chain of command boards - can also be formated as information boards with positions for the posting of paper or brochures like the Halstrom Academy and Alpha Combany above.